Having created a lasting legacy in regard to vehicles that traverse earthly roads, Toyota has set its sights on conquering new terrain - the moon, to be exact! Entering into a partnership with JAXA, Japan’s space agency, Toyota hopes to have a functioning rover rolling across the moon in as little as ten years. Toyota’s well known for its ambitious endeavors, but this might be the one to take the cake and here at Westbury Toyota, we’re very interested in seeing how it all develops. If you’re interested in learning more about Toyota’s moon rover venture as well, we’ve gone over the important details below. This collaboration will allow both Toyota and JAXA to explore the possibilities and probabilities of international space exploration. Their first conceptual project is a manned lunar rover that’s pressurized and runs off of fuel cells. The timeline for development of this lunar rover is surprisingly short - as Popular Mechanics reports, the Vice President of Jaxa, Koichi Wakata, has stated that the goal is to have a manned rover launched into space by 2029. - JAXA Vice President Koichi Wakata. Although the idea for this lunar rover is still in the developmental stage, there are some details available. It will be capable of transporting two passengers, states Michelle Toh of CNN Business, and because it’s pressurized, those passengers won’t have to wear spacesuits. Here in the conceptual stage, the rover is 20 feet long (about the size of two microbuses), 12 and a half feet tall, and 17 feet wide. In addition, this rover would actually have a living space of about 13 cubic feet that can easily accommodate two people (or up to four, in case of emergency). The realization of the Toyota lunar rover would be a massive leap forward in manned space exploration. The last manned lunar exploration vehicle was NASA’s “moon buggy”, the Lunar Roving Vehicle (LRV). It was used as transportation by the astronauts on the Apollo 15, 16, and 17 missions. The Toyota lunar rover would be considerably larger than the LRV, as the LRV’s specs were a length of 10 feet and a height of 3.7 feet. Where the LRV was powered by a couple of 36-volt silver-zinc potassium hydroxide batteries that weren’t rechargeable, the Toyota rover will be powered by clean-energy fuel cells that could endure the harsh environment of space. Fuel cells are ideal for space exploration because they allow a vehicle to travel much further before needing a recharge than vehicles utilizing batteries. With fuel cell technology being so suited to space exploration, it’s hypothesized that the Toyota lunar rover will have a range of around 6,200 miles. A huge issue that needs to be addressed when designing and creating the Toyota rover is how to combat the effects of lunar gravity, as well as the problem presented by the rough terrain of the moon. As mentioned above, there’s also the matters of the unforgiving environment, in particular radiation and extreme temperatures. As Tariq Malik of Space reports, Toyota is more than ready to meet these challenges and surpass them with passenger safety perpetually at the forefront of all design ideas. 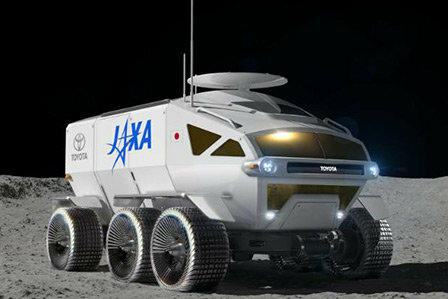 Toyota’s innovations never cease to impress, and its lunar rover concept may be one of the most ambitious yet. Dreaming up the plans for a clean energy moon rover with living space and a focus on safety is something no other automaker has done yet - or likely ever will. Here at Westbury Toyota we’re eager to learn more about this space exploration project as it develops, and we’ll be sure to keep you posted with all the relevant details as they’re released!